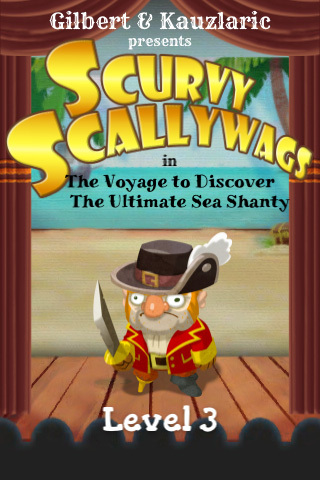 Here are some screen shots from Scurvy Scallywags in The Voyage to Discover the Ultimate Sea Shanty: A Musical Match-3 Pirate RPG or SSITVTDTUSS:AMMTPRPG for short. It will be coming out for the iPhone and iPad in a couple of months. I might have found a way to get xcode to build objective-c for Android, if so, we'll port it there. I've always loved match-3 games, there is something zen-like about playing them. Seems like whenever I'm testing out a new engine or code base, I always create a quick match-3 game. A few years back, Clayton and I made a match-3 game called Realms of Gold that had a interesting way the board collapsed. In traditional match-3 games like Bejeweled, when you match three shapes they disappear and the gap is filled by pieces falling in from the top. In Realms of Gold, the piece could come in from the sides or even the bottom depending on the type of match you did. It was fun, but it was also a little confusing. The game was a RPG, but we were told by the publisher that no one wanted to play a match-3 RPG, so that part of the game was watered down. Of course, a year later Puzzle Quests comes out and sells a billion copies. A little over a year ago I pulled a match-3 prototype out of the closest and started working on it. There was something about the way the board collapsed in Realms of Gold that I really liked. Clayton and I screwed around with it for a bit, then he hit upon a way to make the collapsing work a lot better. Rather than the type of match you made dictating the direction the board collapsed, have the board collapse in the direction you swiped. I made this change and it felt fantastic and very intuitive. An odd side effect of doing this was you could move pieces around the board. 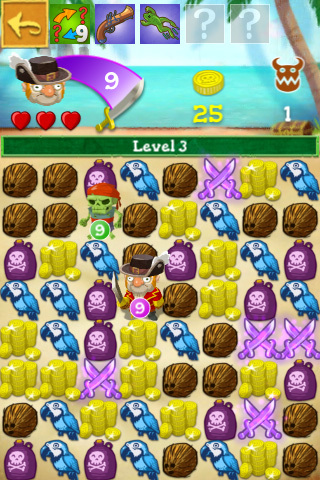 So unlike Puzzle Quest - and just about every other match-3 RPG that sprang up after it - in Scurvy Scallywags you actually move your hero/pirate around the board and position her/him next to enemies to do battle. It creates this new layer to the matching that is a lot of fun. 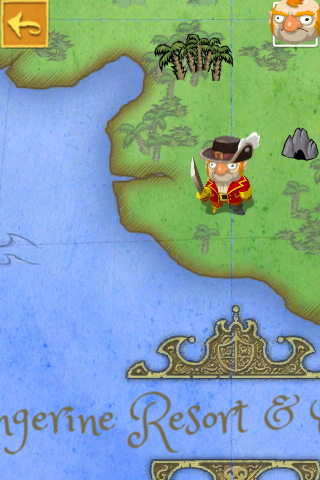 We have close to one hundred different hats, shirts, heads, swords, etc you find and use to dress up your pirate. 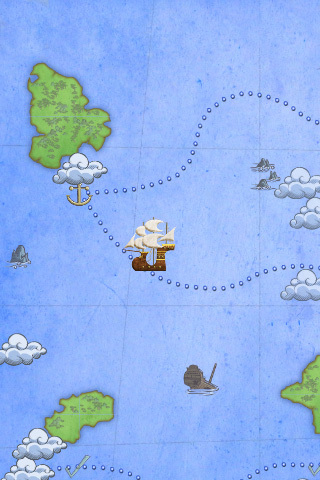 There are also ten different ships to build, plus a sea shanty you collect that is sung by real life pirate singers (they work for grog, quite inexpensive). With any luck, it will be out in the next month or so. You can also follow @ScurvyGit on twitter to see my live git commit messages.